Fully automatically your own offers in the booked portals maintain, recruit and manage. For each portal, you can create a separate ”Job” and fill it quite specifically, the respective portal with the qualifying offer. Especially for portals with certain packet sizes, you have the possibility of targeted and optimized your listings transmitted. Your active property portals are be listed. In the title bar (3) you can switch between the two views. 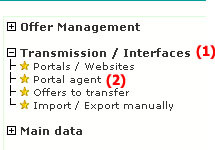 (4) To create a new ”job” or edit an existing one click directly on the name of the portal. In column (5) you can see whether the job is active, or whether he was stopped by you. The column (6) indicates whether you have activated the automatic full maintenance for the portal and in columns (7) or (8) you can find the date of the last or the next start.